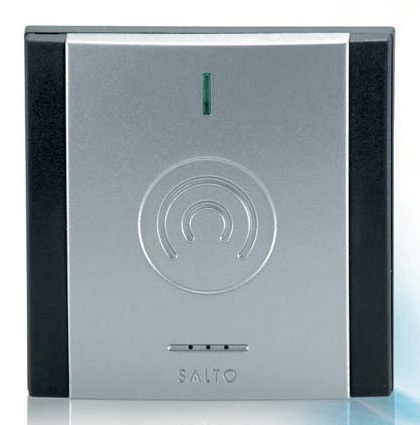 SALTO offers a broad range of 13,56Mhz RFID Contactless Smart Card wall readers. They read encrypted data from the carriers and then communicate it to the door controllers. They also allow for updating of the carriers via SALTO Virtual Network technology. All models are IP 65 compliant making them suitable for use indoors and out, including environments exposed to harsh weather conditions. Compatible with ISO 14.443A, ISO 14.443B and ISO 15.693 (Vicinity) and covering a wide range of mainstream RFID brands such as Mifare, Mifare plus, DESFire, DESFire, Ultralight C, EV1 LEGIC advant , LEGIC prime, HID iClass and Picopass. ID technologies available: DESFire, DESFire EV1, Mifare, Mifare plus, Mifare Ultralight C, Inside Picopass, LEGIC Advant, HID iClass, SKIDATA. IP 56 compliant (depending on the model).